In a large bowl, combine all the dry ingredients. In a smaller bowl combine all the wet ingredients. Stir the wet ingredients into the dry ingredients mix it all together well. fold in the apples. Spoon the mixture into the lined muffin cups and bake in the oven for 30-35 min. Let the muffins cool in the pan for 30 min , then serve. 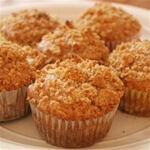 These muffins are great for breakfast or a snack.